Fresh berries, tropical sorbet flavors and a sweet coconut crumb layer make a showstopping dish with just 20 minutes of prep (plus freezing). Combine first 4 ingredients; set aside. Whisk mango sorbet and 1/2 cup COOL WHIP until blended; spread onto bottom of 9-inch springform pan. Cover with half the crumb mixture; press lightly into sorbet. Freeze 1 hour. Whisk coconut sorbet and 1/2 cup COOL WHIP until blended; spread over crumb mixture in pan. Top with remaining crumb mixture; press lightly into sorbet. Freeze 1 hour. Whisk raspberry sorbet and 1/2 cup COOL WHIP until blended; spread over crumb mixture. Cover with remaining COOL WHIP. Freeze 4 hours. Remove torte from freezer 10 min. before serving. Let stand at room temperature to soften slightly. Loosen torte from rim of pan; remove rim. Garnish torte with berries and mint. Substitute sherbet for any of the sorbet flavors. 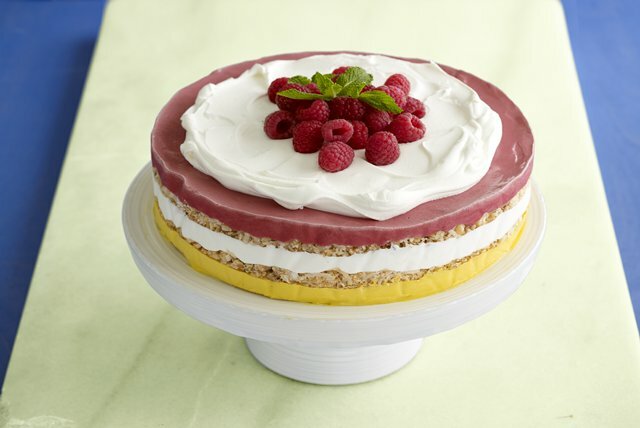 Torte can be frozen up to 24 hours before serving.